Everyone who has ever camped or who loves to spend time outdoors will be familiar with tick bites. Ticks are especially common in the summer months. But what are ticks and where are they usually found? What can be done to avoid being bitten by ticks? If you love the outdoors or have ever experienced tick bites yourself, read on to learn about their identification, prevention and treatment. Tick bites are caused by ticks, small spider-like creatures which belong to the arachnid family. They are basically spiders which feed on human and animal blood. Ticks are usually very small and live in the fur and feathers of animals and birds. They attach themselves to the skin of animals and feed on their blood. They do not commonly feed on humans but they will feed on anything with warm blood when necessary, just as humans will eat any food to survive. Ticks are not the same as bed bugs, though they can have some resemblance in appearance and habits. Tick bites are generally identified by seeing the tick still attached to the skin. As some other insects or creatures may look like ticks, especially the bed bug, being able to recognise a tick is important in the identification of tick bites. Appearance Has 8 small legs, 4 on each side of the body. Their bodies have the capacity to expand when feeding. Size varies depending on the type of tick, or if the tick has just fed. A very engorged tick can be a full centimetre in diameter and is bluish-grey while a non-engorged tick is reddish-brown in color. Has 6 small legs, 3 on each side of the body. An adult bed bug can look like a single apple seed with legs when it has just fed. Color is same as that of an apple seed (brown). Bed bugs do not carry diseases; however, they can affect the psychological health of individuals who live in an infested house, especially those who sleep in the infested room. Habitat and Habits Ticks can be found on pretty much any warm-blooded animal with feathers or fur. 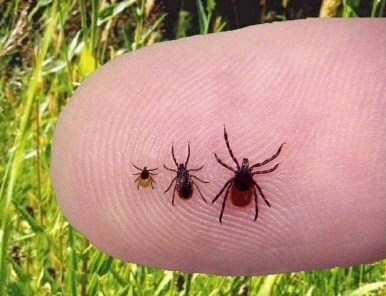 Some ticks are very small, while others can be as big as a grain of cooked rice. They are plentiful near woodlands, which have lots of animals that carry the ticks, such as hares, raccoons, deer, rabbits and squirrels. Ticks thrive better in tropical regions, although they can be found in almost every environment. Bed bugs are found inside the home where they have easy access to food (blood). They are usually found in beds, bedding, bed frames, and items of furniture which are near the bed. Bites Identification Identification of a tick bite is usually simple because the tick is still attached to the skin. A tick bite can easily look like a mosquito bite or just a small reddened area. For the most part, tick bites do not cause signs and symptoms unless the individual bitten is sensitive to the secretions of the tick, or if the tick is a carrier of tick-borne diseases. Identification of bed bug bites is usually made possible because of the visible presence of bed bugs in the location and the appearance of itchy red rashes on the skin. In some cases, rows of reddened and elevated areas appear on the skin, especially in individuals with sensitive skin. If an individual has spent time in wooded areas, for example on camping or hiking trips, and has manifested the following signs and symptoms after the activity, this may be a sign of a tick-borne disease. Avoiding walking in tall grass or shrubs. It is best to walk on clear paths where there are no plants on which ticks may be clinging to. Once a tick is discovered to be attached to a person or a pet, it must be removed immediately. If allowed to stay, the tick might transmit diseases or might cause skin reactions. To remove a tick, grasp the head with tweezers, coming in as close to the skin as possible. Pull the tick away, avoiding any twisting motion. Clean the bitten area with soap and water. Apply an anti-itching cream if itching starts. Observe the tick bite or tick bites if it is many. Allergic signs and symptoms or tick-borne diseases signs and symptoms should receive immediate medical attention. Tick bites can be easily managed by observing the most important rule of all, which is prevention. Proper knowledge of tick bite identification, the signs and symptoms of tick bites, and the correct treatment of tick bites, are also important especially for those who love the outdoors. Those who have pets, or those who live in tick infested areas, should also be sure they know what to do in the case of tick bites.